Here’s a glimpse at what’s in store in the latest collection, Let’s Put on a Show! 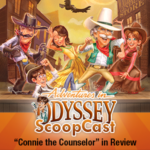 In addition to the CD copy, you can also download Album 62 or listen via the Adventures in Odyssey Club (AIOC). You can learn more about Album 62 at our product page and access ordering links as well.